This little gem from the archives is 100 years old this year. Lost to most of us today is the man who popularized the safety razor, King Camp Gillette. He’s got his picture right on the package! He brought us the thin, disposable type of razor rather than the long 6-inch kind that made Sweeney Todd’s clients so uncomfortable. 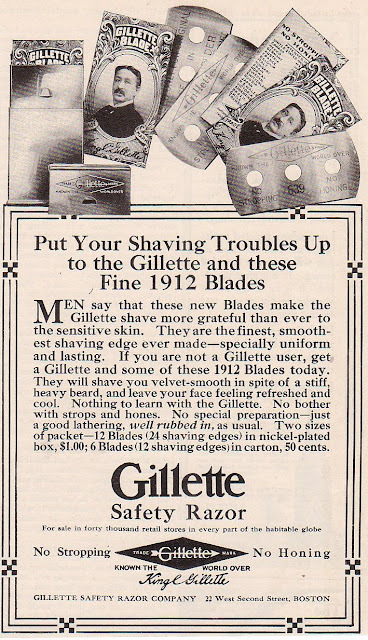 12 blades sold for $1 in 1912 which is about $22 if you take into account inflation. Good news though! No special preparation necessary or training necessary! Just a good, good lather but for the LOVE OF GOD DON’T FORGET TO RUB IT IN! I have no idea why the emphasis on the rubbing as indicated by the italics. Perhaps there was a special Gillette lather rubbing kit sold separately.